One day in a research lab in Denmark some scientists were messing around with bacteria. Little did they know it would wipe out the whole human species. The next day started to experience some symtoms like sneezing and coughing.Then the next day it was extreme hunger and weight loss.Then the next day they went to the hospital.They did`nt know what to do it got worse and worse within days they were dead but they woke up but as zombies.It spread very very quickly and the poulation dropped and the last survivers knew they were watching the end.So what lies ahead of the world! Hi Peter. What a brilliant first attempt at 100 wc. Your story is full of mystery and intrigue! I’d LOVE to know what lies ahead for the world. Well done Peter. This is a great story and you have used the prompt very imaginatively. Your story sounds like the plot to a great science fiction movie. hi Peter that was an exciting story i loved the way you taught of a zombie infection. Yikes! That sounds like a nasty bacteria Peter! I hope that the survivors were able to make an antidote – and avoid the zombies too! 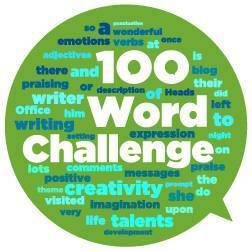 A super first effort for the 100 Word Challenge – keep up the awesome work! Hi Peter great story I like the part when there was only a few people left in the whole world well done for getting picked.